Tall white billowing sails, sun-drenched teak decks and stunning renovations on the Wind Surf sailing yacht make her more spectacular than ever. Chic and contemporary, the graceful ship is large enough to pamper, yet small enough for tiny harbors and hidden coves. Enjoy the relaxed luxury of yachting in casually elegance and comfort. Accommodating just 310 guests, cruise to exciting destinations off the beaten path as you enjoy incredible cuisine and delightful amenities. Gleaming throughout, with romantic lighting and cozy spots, the modern ship also boasts computerized masts. Feel like you are sailing on your own private yacht, as you enjoy Windstar's impeccable service and freedom of choice to enjoy what you like, when you like and with whom. Leave your formal clothes at home as you experience casual elegance at its best. Indulge in a rejuvenating aromatherapy message at WindSpa, for today's active, health-conscious traveler with organic O SPA London products and state-of-the-art equipment in the fitness center with a glass-walled gym with amazing views. Relax on a chaise lounge on deck and take a dip in the pool and two hot tubs. Enjoy live music and cocktails at a number of bars and lounges, including the popular Compass Rose and try lady luck in the casino or browse at the Signature Shop. From the convenience of the watersports platform, go kayaking, waterskiing, ski-tubing and windsurfing. Meet up with new friends at the many lounges and bars, including the popular Compass Rose on the Bridge Deck, The Lounge, Terrance Bar and Pool Bar. Immerse yourself in Windstar's scrumptious cuisine, with open dining featured at all restaurants. Savor delicious 5-star cuisine and exquisite wines at AmphorA. Romantic dinners under the stars are offered at Candles and a delightful French ambiance is featured at the intimate Stella Bistro, where you can indulge in fabulous wine pairings with the appetizer, entrée and decadent dessert. Perfect for breakfast and a delightful alfresco lunch, The Veranda boasts fabulous buffets. Grab a fabulous snack and delicious coffee at the Yacht Club Sandwich and Espresso Bar and dine in your stateroom if you like, served in courses from the fabulous AmphorA. Luxuriate in the tranquility of an oceanview stateroom, with the sparkling sea just outside your windows. All include a plush queen size bed with luxurious linens, flat-screen TV and DVD Player, Bose SoundDock speakers for Apple iPods, a fully-stocked mini-bar/refrigerator, safe, Wi-Fi access, spacious closets and draws. Suites have an extra bath and TV, along with a sitting area. Spa Suites include lush spa robes, tea service and much more. Entertainment on the stunning Wind Surf is low-key, with a small dance combo or singing duo. 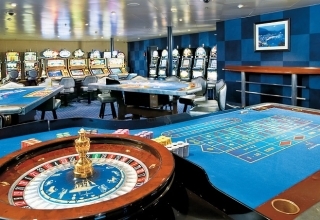 While small, the casino, located just off the lounge, still offers fun and excitement. Head to the many convivial bars and lounges for a fun time. Cruise on the Wind Surf, for a vacation like no other. Cruise on the Wind Surf to the Caribbean, Transatlantic & Repositioning and Mediterranean. (188 sq.ft.) Queen Size Bed with Luxurious Linens; Waffle Weave Robe and Slippers; Flat Screen TV with DVD player; Bose SoundDock speakers for Apple iPods; Fully-Stocked Mini Bar/Refrigerator; Safe; Direct Dial Phone; L’Occitane Bath Amenities; Wi-Fi (internet cards can be purchased at reception); Fresh Flowers; Fresh Fruit; Granite vanity with magnifying mirror and chair; Spacious closets and drawers; Bathroom with teak floors, granite countertop, sink and shower; 110/220 outlets. Accommodates 250 guests and offers a full service gourmet dinner from 7:30pm-9:30pm. Offers a gourmet sandwich bar, espresso drinks, table games, library, Internet stations and the comfiest couches on sea. Relax poolside or at the Jacuzzi and enjoy such touches as iced tea glasses being refilled or fresh, dry towels appearing without a request. Luxuriate in the pleasures of the sun without a care in the world. Try kayaking, waterskiing and windsurfing from the watersports platform. In Wind Surf's glorious Wind Spa, a staff of 10 stands ready to soothe your body, mind, and spirit with a myriad of treatments. Indulge in a massage, an herbal wrap, or dozens of other skin, hair, and nail indulgences. Enjoy your morning coffee or an after dinner drink surrounded by the nightly entertainment (singing duo) that performs in the Compass Rose.